Wash and drain the rice and keep it aside. Heat ghee in a thick bottomed pan and saute cinnamon, cloves, cardamoms and bay leaves. Add sliced onions and saute till light brown. Add ginger paste, garlic paste, green chillies and turmeric powder and saute well till the raw smell disappears. Then add the drained rice and saute for 5 minutes. Add the green peas, chopped baby corn, coriander leaves, mint leaves and salt and mix well. Transfer this to a pressure cooker and add 3 cups of water and mix well . Cover and cook for 2 whistles. Switch off the flame. Open the pressure cooker when the pressure releases or after 10 minutes. Pulao looks so delicious. I am always in for one one pot meals. Delicious and inviting one pot meal. 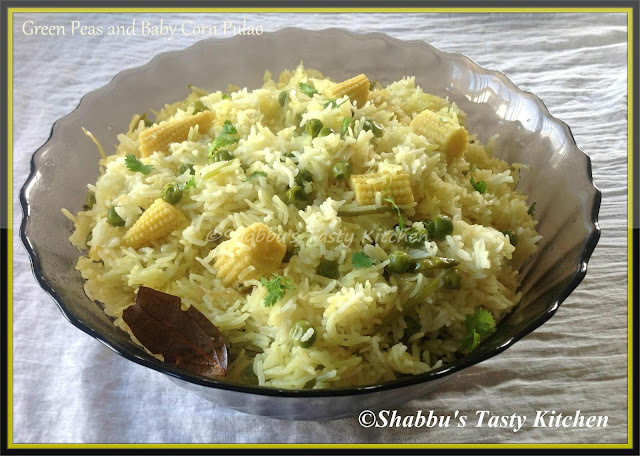 Adipoli pulav with green peas and baby corn. Delicious and yummy it looks. A simple and healthy one-pot meal!